Where Do Confederate Monuments Go After They Come Down? 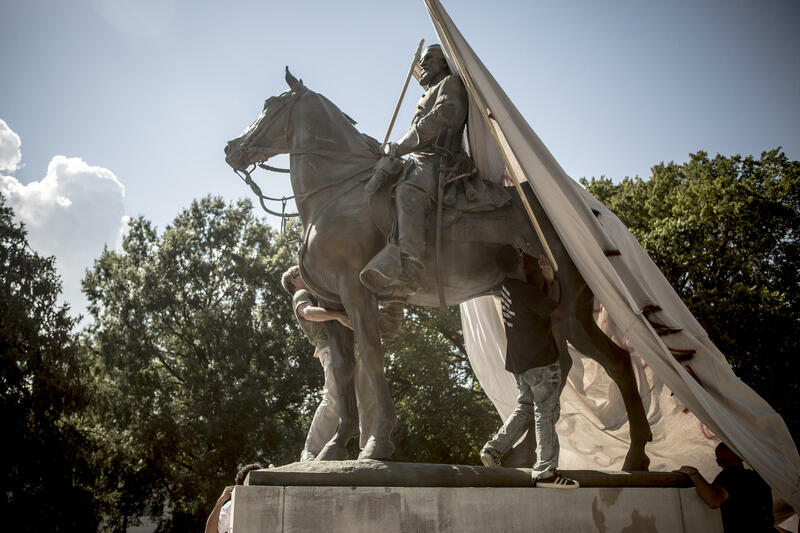 Protesters attempt to cover a statue of Ku Klux Klan leader Nathan Bedford Forrest at Health Sciences Park in Memphis, Tenn., in August 2017. The statue was removed in December. 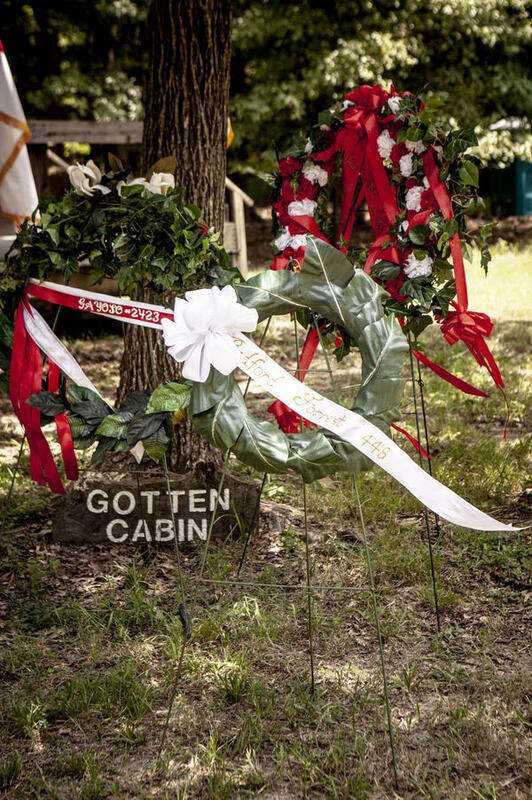 United Daughters of the Confederacy and the Sons of Confederate Veterans place wreaths to honor Forrest. 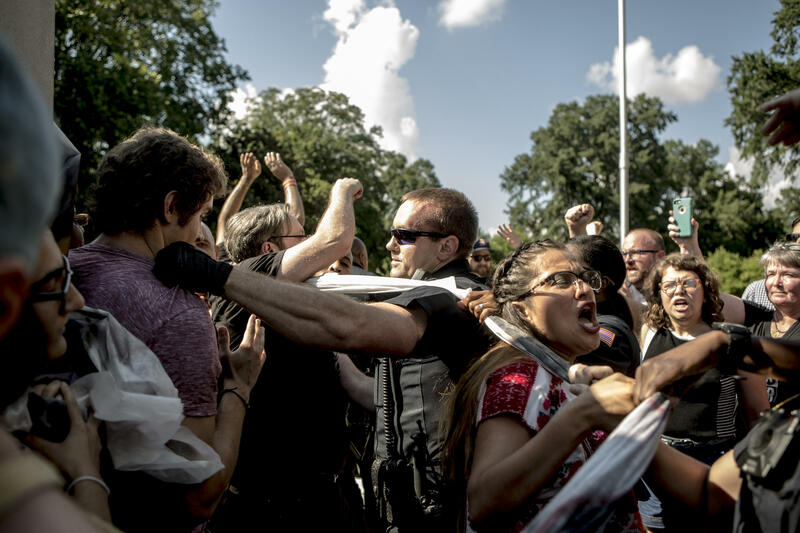 Protesters and the police struggle in August 2017 after officers tore down banners that demonstrators attempted to hang on a statue of Nathan Bedford Forrest in Memphis. On Dec. 20, 2017, Memphis allowed the sale of Health Sciences Park to a new nonprofit, which then removed the statue of Forrest. The statue, another one and a bust are being held in a secret location. 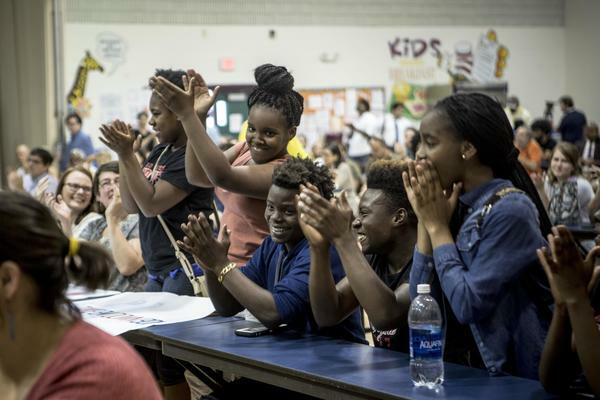 High school students applaud a classmate who spoke during a June 2017 organizing meeting for #TakeEmDown901, which formed in Memphis to protest the city's Confederate statues. Lee Millar of the local Sons of Confederate Veterans chapter reads a proclamation declaring July 13 "Nathan Bedford Forrest Day" at a celebration honoring the Confederate general. A moment of prayer is held during the celebration marking the 197th anniversary of Nathan Beford Forrest's birthday, in July at Davies Manor Plantation in Bartlett, Tenn.
At the Forrest celebration, Gary Elam holds a photograph of his great-great-grandfather, Maj. Oliver Buckley Farris, who fought in the Confederate army. People arrive at Davies Manor Plantation for the event celebrating Forrest, a Confederate general whose ties to Memphis include a successful slave-trading business there. Civil War re-enactors representing members of the Confederate army's 9th Mississippi and 51st Tennessee infantries deliver a musket salute. 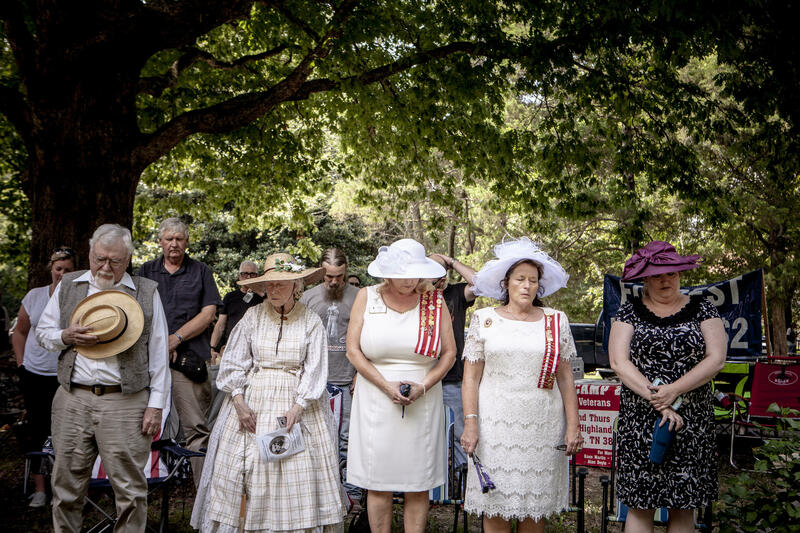 Members of the United Daughters of the Confederacy and the Sons of Confederate Veterans arrive to lay wreaths at Health Sciences Park, where the statue of Nathan Bedford Forrest stood in Memphis. A fenced-off pedestal at Health Sciences Park in Memphis is all that is left of a statue of Nathan Bedford Forrest, which is in a secret location pending a court case. Van Turner has a secret: He knows the whereabouts of the controversial Confederate statues removed last year from two parks in Memphis, Tenn.
"They have to be kept in a secretive location," said Turner on a recent afternoon, standing in a park overlooking the Mississippi River where one of the statues — of Confederate President Jefferson Davis — once stood. "For fear of someone trying to go in and get them." 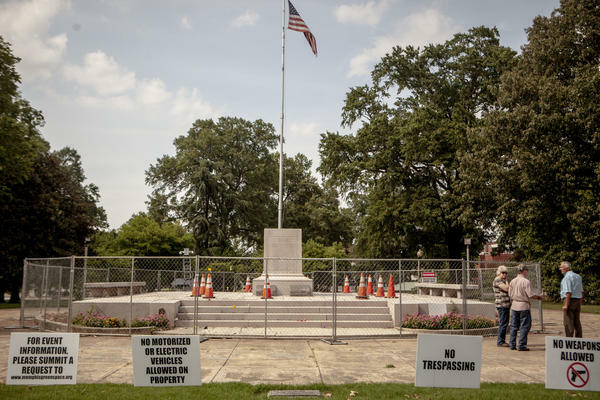 Turner, a Shelby County commissioner, has been hiding the Jefferson Davis statue since it came down in December, along with a statue of Confederate Gen. and slave trader Nathan Bedford Forrest and a bust of Confederate Capt. Harvey Mathes. They're among the more than 45 Confederate monuments that have come down in at least 27 cities across the country since last summer, when white supremacists rallied in Charlottesville, Va., to protest the removal of a statue of Confederate Gen. Robert E. Lee. In the aftermath, counterprotester Heather Heyer, a 32-year-old paralegal, was killed. The violence amplified calls for the removal of such monuments and spurred an ongoing debate over whether tributes to the Confederacy have a place in public spaces. 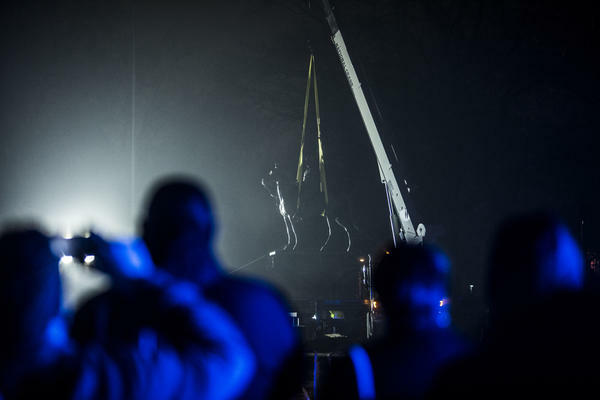 Amid that debate, cities like Memphis are now dealing with a different problem: what to do with the controversial statues once they're removed from public spaces. In many cases, they remain hidden in storage while municipalities decide their fate. It's not just Memphis. New Orleans is still storing four Confederate monuments more than a year after they were taken down. Mayor LaToya Cantrell has yet to announce a plan for relocation. The city of Baltimore is also keeping four monuments, which came down last August, in a secret location while a city task force decides what to do with them. The situation is particularly complicated in Memphis, where the majority-black city had to resort to an intricate legal loophole to remove the statues in the first place. In Tennessee, it's illegal for cities to remove historical monuments without approval from the state. Six other states — Alabama, Georgia, Mississippi, North Carolina, South Carolina and Virginia — have similar laws. Memphis petitioned the state for a waiver but was denied. So Mayor Jim Strickland, a Democrat and Memphis' first white mayor in 24 years, found a workaround. "It prohibits government from doing it, but it doesn't prohibit a private person from doing it, on private property," says Strickland, who took office in 2016. Protests against the statues had been growing throughout the summer of 2017, and he needed to act. "We needed to find a way to do it legally." The city's attorney pitched an idea to Turner, the local county commissioner: Turner would create a nonprofit, the city would sell the two parks to the nonprofit — for $1,000 each — and the nonprofit would remove the statues. It was a risky gambit. "You would possibly get death threats," Turner says, recalling his thoughts at the time. "Are you willing to endure this, knowing that you are a husband and a father? And I said yes." The plan worked. On Dec. 20, the Memphis City Council approved the sale to Turner's new nonprofit, Memphis Greenspace. That same night, he brought in cranes and the statues came down. Turner wasn't planning to hold on to the statues indefinitely. He had imagined a museum would take them. Or maybe a Confederate cemetery or a historic battlefield. 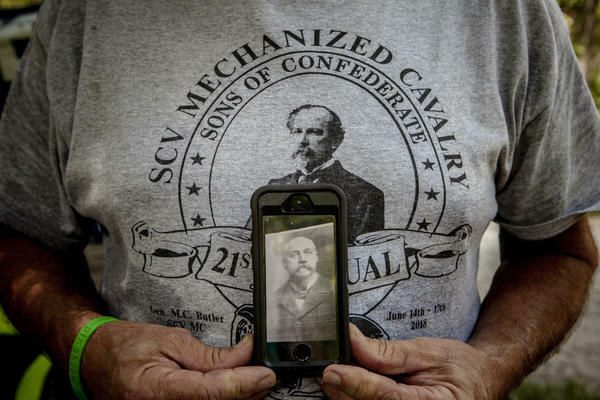 Instead, the Sons of Confederate Veterans, a nationwide organization that fights to preserve Confederate history, sued the nonprofit and the city, accusing them of violating state law. A lower court ruled in favor of Memphis and the nonprofit. The suit is now with the Tennessee Court of Appeals, and Turner is forbidden from moving the statues until the proceedings are over. But even without the legal morass, it's unclear who would be willing to take the three Confederate monuments. Museums, which might seem like the obvious choice, are often hesitant to take them on. 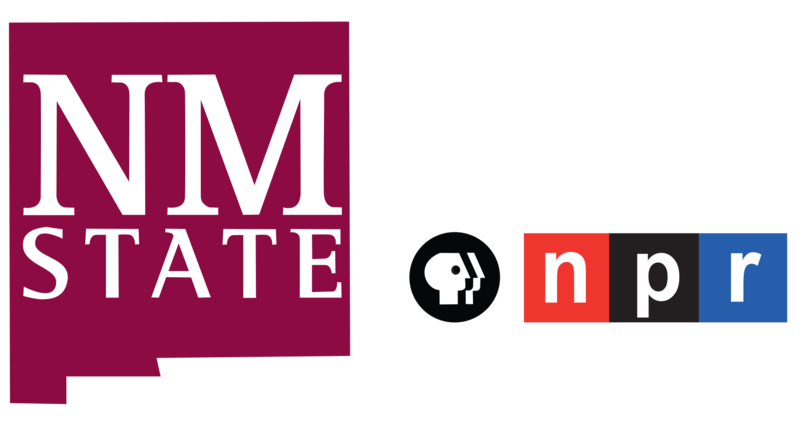 "Truth is, we absolutely could not take them," says Christy Coleman, CEO of the American Civil War Museum in Richmond, Va. Coleman often receives calls from cities hoping to find homes for their Confederate monuments. "The biggest reason, I'd say, that museums aren't able to accept them is that they simply can't afford to take care of them," says Coleman. Many of the statues were built for large public forums, creating logistical challenges for museums. A prominent statue of Robert E. Lee in Richmond, for example, is more than 60 feet tall, including its pedestal. "[Most] museums are not equipped ... to not only take and place them, but to provide the kind of care and conservation required to ensure that they are around for perpetuity," says Coleman. That's not the only challenge. "Sometimes when you take on artifacts or things that will skew one's mission and/or collection direction and resources toward something that you know strays from its strategic work, that's problematic," Coleman says. In 2016, a history museum in Gainesville, Fla., refused to take a Confederate statue from the county government, citing the high costs of creating an entirely new exhibit. The Smithsonian has also said that it does not accept monuments — Confederate or otherwise — into its collection. Even if a museum could accommodate the costs and logistics, contextualizing Confederate statues for visitors is a challenge for curators, considering how racially and politically charged the objects still are. "They say things about gender, they say things about race, they say things about militarism that would take more than a plaque to sanitize," says Ben Wright of the Briscoe Center for American History at the University of Texas, Austin. Despite these challenges, Wright and his team believe they've figured out one approach to the curatorial dilemmas: focus specifically on the time period in which the Confederate statue was created. Last year, the Briscoe Center designed an exhibit featuring a statue of Jefferson Davis that once stood on campus. Instead of highlighting Davis' role in the Civil War, it tells the story of the statue's creation, placement and the subsequent controversy on campus. "It's a history of the statue, which touches on race relations, it touches on the way the monuments were contested at the time," says Wright, who curated the exhibit. In this case, it was the 1920s, at the height of Jim Crow laws. "What we did by concentrating on the statue and the rich archival sources around the statues, we were able to create a space where all those things get talked about." For those who fought to remove the statues, the question of what to do with them is a simple one to answer. "I believe that Confederate statues should be disposed of," says Tami Sawyer, the founder of #TakeEmDown901, the group that formed in Memphis to protest the city's Confederate monuments. "You don't need oppressive structures in museums." 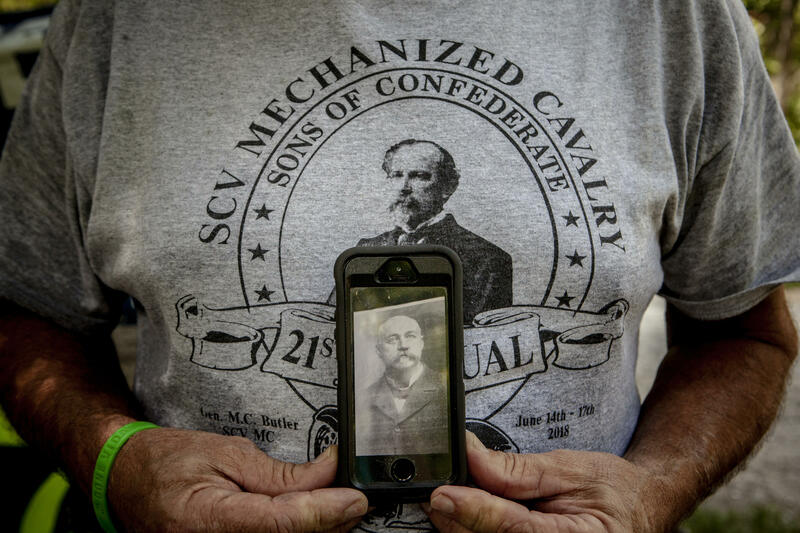 In Memphis, the Sons of Confederate Veterans — which helped pay for the city's two prominent statues — wants more than just the return of the monuments. "The statues go back up, of course," says Lee Millar, regional spokesman for the group, which is suing both Memphis and Turner for removing the statues. "We'll fight as long as it takes, all the way to the end. Because the solution is to put the statues back up," Millar says. 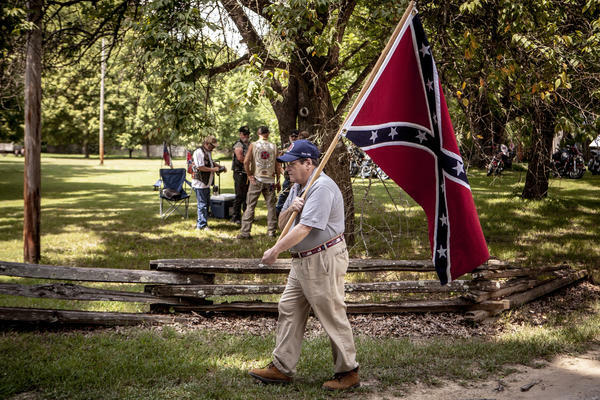 Opponents of the Forrest statue point out that the Confederate general was a slave trader who, according to the Mississippi Civil Rights Project, was also an instrumental figure in the early years of the Ku Klux Klan. But for Millar, who says he is a distant relative of Forrest, the statues deserve to be in the public sphere because they were meant to honor military service. "The citizens back then were erecting these statues to those veterans," says Millar, who lives in Collierville, a suburb of Memphis. "It had nothing to do with race, nothing to do with slavery." 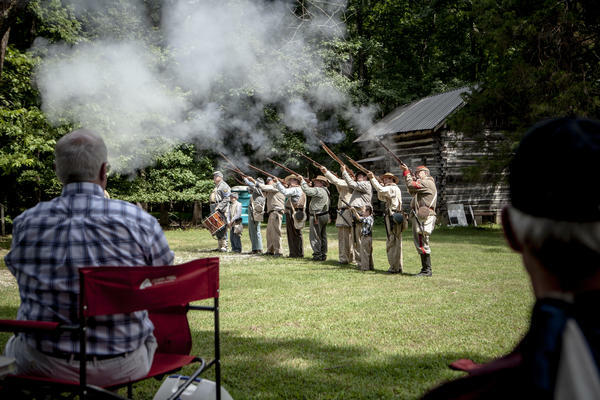 In mid-July, the Sons of Confederate Veterans threw its annual birthday celebration for Forrest, at Davies Manor Plantation in Bartlett, Tenn., just outside of Memphis. Confederate soldier re-enactors marched in formation and fired off a musket salute to honor the general. 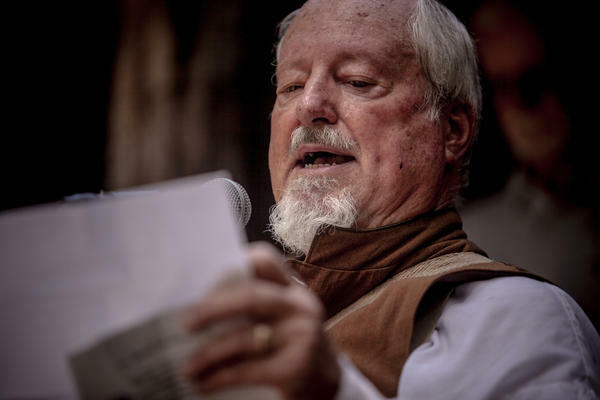 At a folding table in a corner of the yard, Millar collected donations in a large water jug with the label "Save Our Parks" to help with the legal costs of the lawsuit. Seven months after the Forrest statue came down, attendees were still angry. "I think it's deplorable," said Paul Alford, an group member from Memphis. "The city council all needs to go to jail." Others, like Gary Elam of nearby Potts Camp, Miss., are fighting with their wallets. "Since they took the statues down on Dec. 20 of last year, I have not spent one red cent in Memphis," said Elam. "I'm not going to put any money in the coffers as long as they're acting the way they're acting." Elam is not alone. In April, the Tennessee legislature stripped $250,000 earmarked for Memphis from the state budget, with Republican lawmakers citing the statue removals as the reason for the vote. But Mayor Strickland isn't worried. "We'll be able to handle it," he says. "We knew that there would be some pushback." And Strickland stands by the decision to take the city's Confederate monuments off public property. "If you go to Germany, there is no statue of Adolf Hitler. But you certainly learn about Adolf Hitler. And people ought to have in their history textbooks and in museums a history of Nathan Bedford Forrest," Strickland says. "But statues are for honoring people. 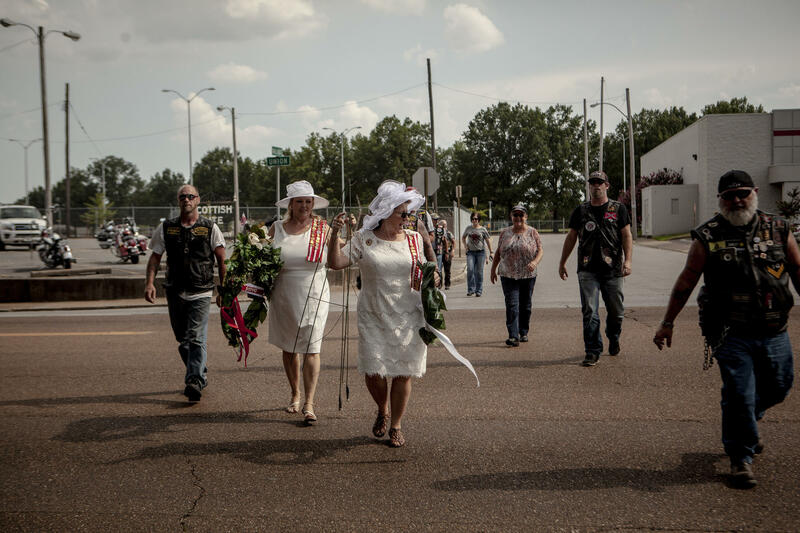 And Memphis of the 21st century does not want to honor that individual." The saga is far from over. The lawsuit against Memphis and the nonprofit that removed the statues is expected to stretch on for the rest of the year. In the meantime, the tedious responsibilities of owning recreational parks — mowing the grass, cleaning the sidewalks, keeping the lights on, paying for insurance — are beginning to add up for Van Turner, the statues' reluctant owner. He estimates it will cost him at least $30,000 this year. And, as he feared, his family has received death threats. Still, Turner believes that once the litigation is over, he'll be able to find the statues a new home. "I think there will be more than one group interested," he says. "This is still American history." Jolie Myers edited and Noah Caldwell and Melissa Gray produced the audio stories. Maureen Pao edited the Web version of the story.